What is OnSite Property Manager? OnSite Property Manager is a simple and affordable web-based rental property management solution that automates a lot of tasks related to handling rental and property units, organizes tenant documents and property photos in one place, helps users easily manage and track the financial aspect of their business, and enables them to generate more income. The cloud-based application eliminates the complexity found in other software applications, allowing property owners, managers, and investors to easily use it even if they don’t have a previous experience. OnSite Property Manager is also designed to remove paperwork in rental property management. Thus, tenant documents, work orders, rental and property images, tenant payments, and expense receipts are all stored online, and users can access them anywhere from their mobile devices. This helps users save time, enhance staff efficiency and productivity, and increase mobility. With OnSite Property Manager, users will be able to calculate rental fees and other charges and post them automatically. It also enables them to keep track of their expenses and pay their bills on time. The rental property management software ensures that tenants are able to smoothly move into rental properties or units and move out of them smoothly. Tenants can send payments through an online portal and users can also change rental terms conveniently. The solution has the capability to automatically post vacant properties or units on company and advertising websites. Last but not least, Online Rental Management Software enables rental property owners and managers to access updated reports and print them immediately. Online Rental Property Management is simple and easy to use. Thus, it is designed in a way that users are able to easily access all the information related to their rental properties or units and transactions. The software has a powerful feature which is considered as the heart of it. This feature is called Rolled Out page, a webpage that organizes all the information that property owners, managers, and staff need and centralizes all the tasks they need to perform. From the Roll Out page, users will be able to access tenant information, tenant payments and notes, tenant statements, bank deposit slips, unit flyers, statements, and more. Here, they can keep records of their transactions, update information about their tenants and units, register tenants who are moving in, as well as print daily bank deposit slips. The software offers an auto-posting feature. With this feature, prorated rental fees are automatically calculated and posted as tenants move in and move out. Recurring charges can also be posted instantly such as the charges for utilities and property taxes. When the rental fees and other charges are posted, invoices are sent to tenants so that they will be aware of the things they need to pay and send their payments quickly. The feature ensures that users won’t lose any money and that they can increase their income effortlessly. With OnSite Property Manager, property owners, managers, and staff no longer need to store mountains of paper files and folders that contain tenant documents, expense receipts, vouchers, work orders, and property or rental photos. This is because the software has an online storage where they can save all the documents they want, upload numerous property pictures, and store all work order attachments they need. The online storage, therefore, makes it easy to reuse documents and photos. For instance, property photos can be uploaded all at once and added repeatedly to websites and flyers where vacancies are being advertised. Also, when they email or print documents for tenants, the software automatically saves those documents. Aiming to build paperless offices, the rental property management solution also eliminates paper documents from the work order management process and automates it through instant notifications. Thus, when users need to prepare work orders for maintenance tasks and other services, all users have to do is simply supply the work order information required and attach the related photos or documents. Then, the software instantly sends emails or text messages to the vendors, permitting them to access all the information they need. When the vendors are done performing the works, they will be able to completely add their notes, record their worked hours, and enter all costs associated with the jobs they have done. OnSite Property Manager makes the process of engaging with prospective tenants, moving tenants in, and moving them out easier to manage. Because of this, users will be able to deliver a hassle-free and outstanding experience to their prospective, current, and past tenants. For instance, if they have existing tenants before they decided to use the software, they just have to enter the existing account balances of those tenants and the software will track the balances and consolidates them before tenants make payments. If they have tenants that want to transfer from one unit to another, they can instantly calculate the fees and charges, enabling them to automatically add or deduct amounts. When tenants move out, tenants can generate property condition reports or statements of deposit allocation with just a single click. OnSite Property Manager provides a flexible rental term management feature which permits property owners and staff to specify any rental terms they want. The software actually supports monthly, bi-weekly, weekly, and short rental terms. As they choose a rental term, they can set the appropriate rates and deposits. If they need to change a tenant’s rental term, the software enables them to do that easily, applying automatically the rates and deposits for the new rental term. They can also set payment schedules according to the rental term they set, and the software notifies them about the future dates when the rental fees are posted automatically. 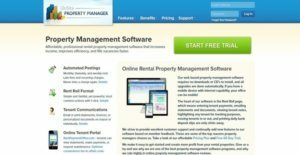 RentalPaymentOffice.com is the tenant portal site for OnSite Property Manager. From this portal, tenants can view their statements, send payments, and even request maintenance works. Thus, it organizes all tenant accounts. When a tenant makes a payment, it will be posted automatically to his or her account. They can also print receipts directly from the portal. OnSite Property Manager delivers an expense tracking feature which allows users to view the bills and invoices they need to pay. Thus, they will be able to see the amounts they have paid, the amounts that are due soon, and those that are past due. In addition, this feature uses color-coding so that they are always reminded of their expenses and pay their bills on time. The software provides users with the capability to create form letters that they can customize and personalize. They can take advantage of its set of preformatted form letter templates so they can quickly generate and email or print the documents that their tenants need. Additionally, they can customize these templates for a specific tenant, groups of tenants, or all of their tenants. What’s great about this is that when they customize these form letter templates, the software permits them to automatically fill out information. They will be able to specify which areas in the form letter will be filled out automatically using data elements. They also have to option to leave areas where data should be entered manually after the form letter is printed. If they want to create their own form letters from scratch, the software makes that possible too. Vacancy advertising is another automated feature available in OnSite Property Manager. With this feature, users can define their vacant properties or units which are automatically posted on their company website or third-party vacancy listing websites. As the software instantly lists their vacancies, a link to their online rental property application page can also be included. This way, tenants can discover their vacant properties as early as possible and will be interested to move in. They can also create their own flyers and email them to prospective tenants. If you are interested in OnSite Property Manager it might also be a good idea to investigate other subcategories of Best Property Management Software gathered in our base of B2B software reviews. There are well-liked and widely used systems in each software group. But are they necessarily the best fit for your enterprise’s unique needs? A popular software product may have thousands of users, but does it provide what you require? For this reason, do not blindly spend on popular systems. Read at least a few OnSite Property Manager reviews and think about the aspects that you want in the software such as the price, main features, available integrations etc. Then, select a few apps that fit your needs. Try out the free trials of these apps, read online opinions, get explanations from the vendor, and do your research systematically. This in-depth homework is sure to assist you select the best software platform for your organization’s unique needs. How Much Does OnSite Property Manager Cost? We realize that when you make a decision to buy Property Management Software it’s important not only to see how experts evaluate it in their reviews, but also to find out if the real people and companies that buy it are actually satisfied with the product. That’s why we’ve created our behavior-based Customer Satisfaction Algorithm™ that gathers customer reviews, comments and OnSite Property Manager reviews across a wide range of social media sites. The data is then presented in an easy to digest form showing how many people had positive and negative experience with OnSite Property Manager. With that information at hand you should be equipped to make an informed buying decision that you won’t regret. What are OnSite Property Manager pricing details? What integrations are available for OnSite Property Manager? If you need more information about OnSite Property Manager or you simply have a question let us know what you need and we’ll forward your request directly to the vendor.